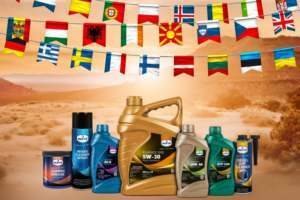 Eurol Motocycle System Clean | Eurol B.V.
Eurol Motorcycle System Clean is an additive, formulated to rapidly clean the entire petrol fuel system. Eurol Motorcycle System Clean is advised to be used if you notice that the petrol quality is of inferior quality and the engine suffers from power loss. If the petrol quality is inconsistent, it can cause carbon deposit build-up, inefficient ignition and combustion and poor power output. Especially small, high output engines are extremely sensitive to deposits that build up in the combustion chamber and the fuel system. Eurol Motorcycle System Clean can also be used if poor quality fuel has been used over some time, to cure problems which have been accumulated during the use of lesser quality fuel. After using Eurol Motorcycle System Clean you can hear and feel a significant difference in how the engine runs. The 100ml bottle of Eurol Motorcycle System Clean is recommended for use in 15L to 25L of fuel. For optimal results, use in two consecutive tanks of fuel or every 2.500 km. Shorter use intervals are recommended with in-city driving. Users should consult the Material Safety Data Sheet of Eurol Motorcycle System Clean for information about storage and shelf life. Please ask Eurol Research & Development if any further information is required.